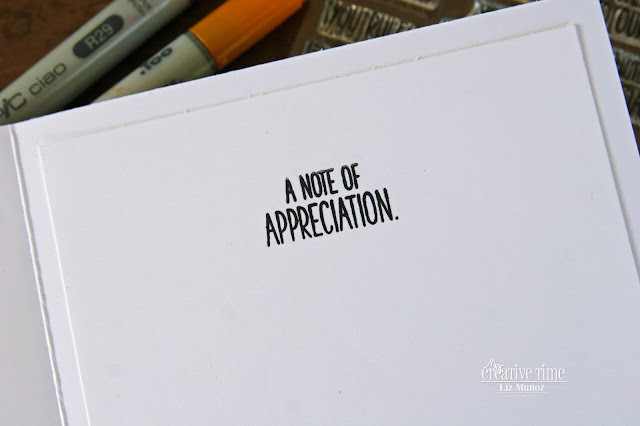 Liz's Paper Loft: MCT April Release Sneak Peek Day 1 ~ thanks! Happy Tuesday to you! Today is Day 1 of My Creative Time's April Release Sneak Peeks. We have a super fun week planned for you filled with lots of inspiration! So let's get to it with today's set You're All Write stamp and dies. This super fun set if filled with fun sentiments and two cute pencils. Using the larger pencil image, I copic colored the image and die cut it. The "thanks" die is from an older set. The sentiment on the side of the card is from this new set. See you tomorrow with a new project! OMG Miss Liz..WOWIE WOW What a Super Cool & Cute card. Your Pencil guy is so Adorable...Fab. Coloring job!! Love the embossing folder you used for your card...it's a fav of mine....You totally showcased today's sneaky peek in one Spectacular way...You did a Super Outstanding Creative job!! YOU so ROCK!! Adorable card!! Love the embossed background! Such a darling card! Love how you embossed the front! The pencil is just the cutest! Love your card! Awesome new release! I love your super cute card ! Terrific card! 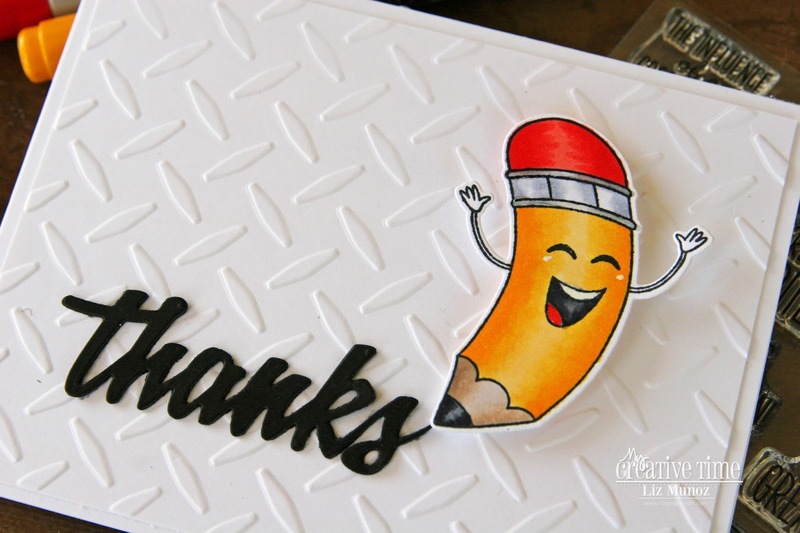 The thanks die works perfectly with the cute pencil! Love it! Soooo CA-UTE!!! Wonderful card! LOVE this stamp set! This is a great set that can be used for many reasons, as you cleverly show using the pencil to spell thanks! I would not have thought of that way to use the pencils. Wonderful job. So cute and adorable. 😍 Love it. This is so beautiful! Great products, great work! Super cute card!! Thank you for the inspiration! Sooooo cute! I love how the little pencil looks like it's writing! Great idea! You never disappoint us. You are fabulous, Liz. Thanks for sharing! 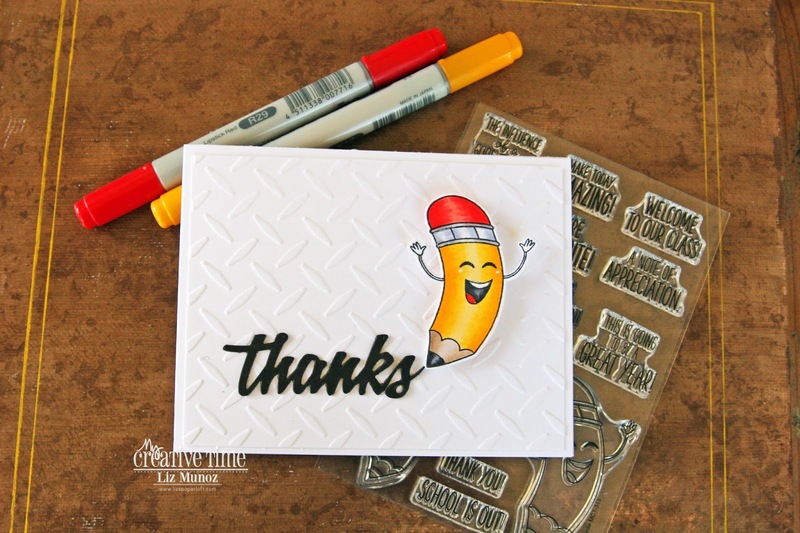 I have that embossing folder and it looks great behind the cute pencil!